The original Wilts & Dorset bus company first came into being in February 1915 operating just one bus in the Salisbury area. The company grew as services developed and smaller operators were taken over. In 1948 Wilts & Dorset was nationalised as part of the Tilling group. From 1st January 1969 Wilts & Dorset became part of the National Bus Company. Under the auspices of the NBC the Wilts & Dorset fleet name disappeared in 1972 as the company was merged with Hants & Dorset. Following the 1980 Transport Act, the NBC was split up and the name Wilts & Dorset returned to the sides of the buses in 1983. Following deregulation in 1986 a new privately owned Wilts & Dorset re-emerged in 1987. The next milestone was in August 2003 when the company joined the Go-Ahead Group and along with Southern Vectis, Bluestar, Marchwood, Damory and Tourist became Go South Coast. In Salisbury the buses are now branded ‘Salisbury Reds’ and in the rest of the network the name ‘more’ is the brand name. The year 2015 marks the centenary of the formation of the Company and it was decided by the Company that it should be marked in style! An event was planned for Sunday 14th June 2015 to take place on the Market Square in Salisbury. A large number of preserved buses and coaches were invited to operate a number of services that would have operated over the past 100 years. As you would expect, the independent transport videos cameras were on hand to record the day’s events for posterity and for you to enjoy! We start the day bright and early at the Market Square as the display buses get into their positions, these buses being representatives of the current Go South Coast fleets. Then it is action all the way! Our filming locations are all around Salisbury city centre for most of the day including Blue Boar Row, Castle Street, Silver Street, New Canal, Minster Street, Winchester Street and Mill Stream Approach. All the visiting buses are filmed, along with the normal Sunday operations of the current Salisbury Reds fleet. This includes the two Scania double deckers in heritage liveries, one being the 1930s red and grey livery, the other in Tilling red and cream and both are seen in service on the r1 route. 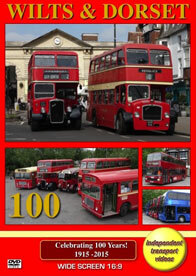 In the late afternoon a photo shoot was arranged featuring the five oldest Wilts & Dorset buses attending on the day. This was done at the coach station and included a Bristol L, Bristol KSW, Bristol LD and two Bristol REs. Our final scenes of the day are back on Blue Boar Row and the Market Square as the display buses make for home. We would like to thank Andrew Sherrington and the “H&DW&D” group for their help in the making this programme, and for organising such an enjoyable event.